After a short break, the Flash Fire Mini-Reviews are back (from the dead)! Zombies have always had a following among horror fans. We have several reviews of great zombie games, books and more here on Flames Rising. Among the recent zombie reviews are Plague of the Dead 2, Happy Hour of the Damned and Zombie Fluxx. There are plenty more, including great titles from Permuted Press and Eden Studios. Join authors D.L. Snell, John Sunseri, Ryan C. Thomas, and David Dunwoody as they fire four more rounds into the growing horde of living dead. Headshot Quartet is the fourth installment in the Undead series from Permuted Press (read reviews of Skin & Bones and Flesh Feast for more information). This time Permuted Press mixes things up a bit by offering four novellas in this collection instead of a short story anthology. I think this is a great move as it requires the authors to focus on more-involved plots and characters, and I didn’t feel that the collection had to focus on the same tired plots and themes. From voodoo to psychics, there’s enough horror and intrigue to satisfy even the pickiest zombie-loving reader. From all corners of the world, they come. Leaving their graves for food or vengeance, or by the command of mysterious powers, the dead walk among the living. As they always have. Some will go down before your shotgun just like the brain-eaters back home. But others are harder to kill. Some can only find rest when they have completed their purpose, and some cannot be killed at all. Ever. 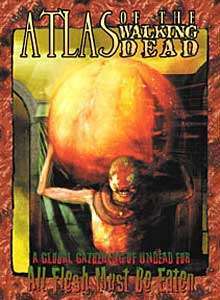 The Atlas of the Walking Dead is a supplement for the All Flesh Must Be Eaten RPG. Sometimes when you are getting ready to run a game of All Flesh Must Be Eaten you feel like mixing things up a bit and adding a bit of mythology or mystery to the adventure. Perhaps the players have already figured out clever ways of killing those regular “movie” type zombies and you’d like to throw something completely different at them. Well, Atlas of the Walking Dead is full of new types of zombies, a few vampires and plenty of other “dead” horrors. There are also a few new rules and plenty of new Aspects for building monsters. This also makes Atlas of the Walking Dead an excellent “monster guide” for other Unisystem games like C.J. Carella’s Witchcraft and even Conspiracy X 2.0. Atlas of the Walking Dead is available at RPGNow.com. This zombie tale has a little bit of everything a fan of the genre would want. Suspense, gore, great characters and plenty of zombies. The fast-paced action in Rise and Walk never stops, keeping the reader entertained all-the-while. Hordes of undead swarm the characters forcing them to fight desperately throughout the story, which keeps you turning page after page to the end. Four characters band together in this tried-and-true version of a nod to classic zombie tales. Chilling, descriptive, an zombie-riffic this is a collector’s must-have as we’ll be sure to see this author, Gregory Solis, on more horror book titles. Rise and Walk is available at Lulu.com. Milla Jovovich is back to kill more zombies in the third chapter of the hit Resident Evil franchise! An action/horror film filled with huge special effects and edge-of-your-teat terror! Survivors of the Raccoon City catastrophe travel across the Nevada desert hoping to make it to Alaska. Alice (Jovovich) joins the caravan and their fight against the evil Umbrella Corp. I had really high hopes for this movie. I enjoyed the previous films quite a bit and was hoping for further development of the characters and the “evil corporation” plot. Not much of either made it into the film. There was plenty of great action scenes and hordes of zombies, but neither really got used very well. Alice has developed powerful psionic abilities, but she only gets to use them a couple of times in the movie. This film introduced several new characters, none of which get developed at all. However, they don’t really matter all that much when it comes to watching Milla Jovovich slaughter zombies. The fight scenes were excellent and very entertaining. If you don’t care about characters and just want some gore…this movie is right for you. This is it true believers, the cross-over of the century begins here! The Marvel Zombies come face-to-face with Dynamite Entertainment’s Ash from the Army of Darkness! Ash has faced legions of the undead before, but never like this… as he lands in the heart of New York just as the Zombie outbreak begins! See how his actions help turn more heroes and villains into Zombies! Under the watchful eye of Marvel Zombie guru Robert Kirkman, this might just be the comic event of 2007! Plus: The entire series will feature classic “homage” covers from painter Arthur Suydam! I should not have worried about it. Marvel Zombies vs. Army of Darkness is crazy, funny and worth getting for any fan of either Marvel super heroes or Ashley J. “Ash” Williams. That does it for the zombie edition of Flash Fire Mini-Reviews here on Flames Rising. There are so many great books and other fun zombie products out there that I’m pretty sure the rotting horde will be back for more soon enough. As always, let us know what you think of these reviews and post some suggestions for other themes that you would like to see included in the series.